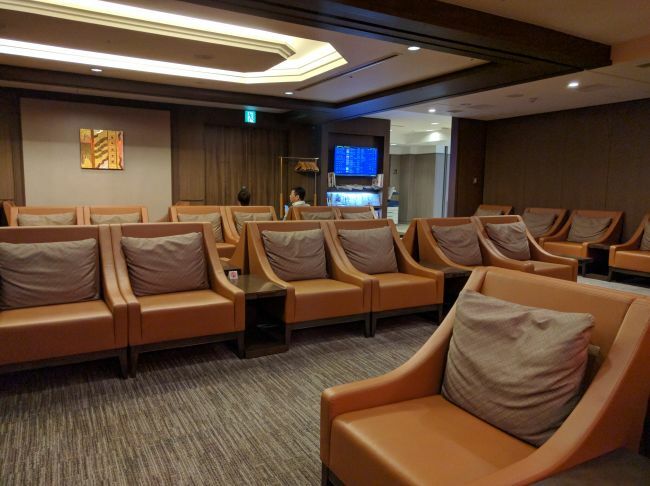 JAL operates its 787 with angled lie-flat business class seats from LA to Osaka. Due to our flight delay, we had been given two $20 meal vouchers at check-in. 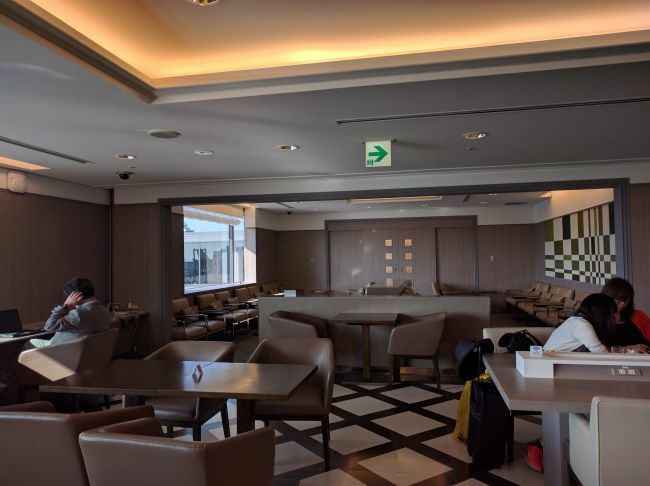 However, due to the free food at the lounge, we decided to buy a box of chocolates in the terminal to give to the crew. 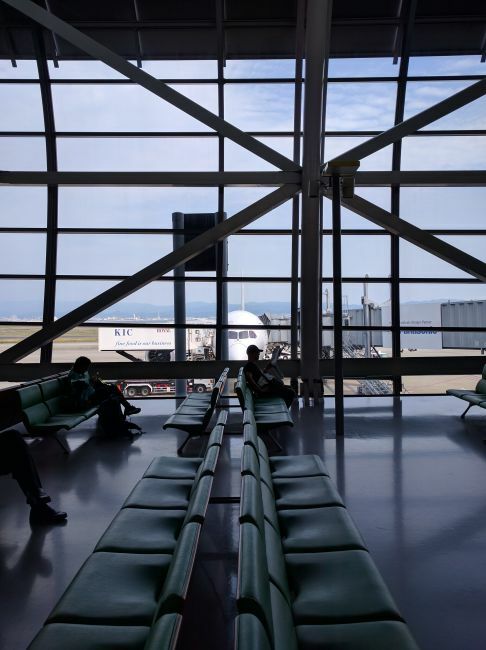 Overall, service was impeccable, whether due to the half-empty cabin or our gift at the beginning of the flight. 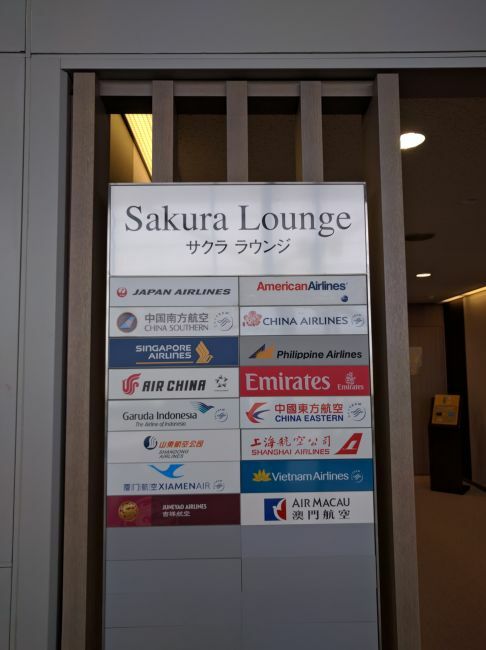 This particular flight featured JAL’s angled-lie flat business class seats. 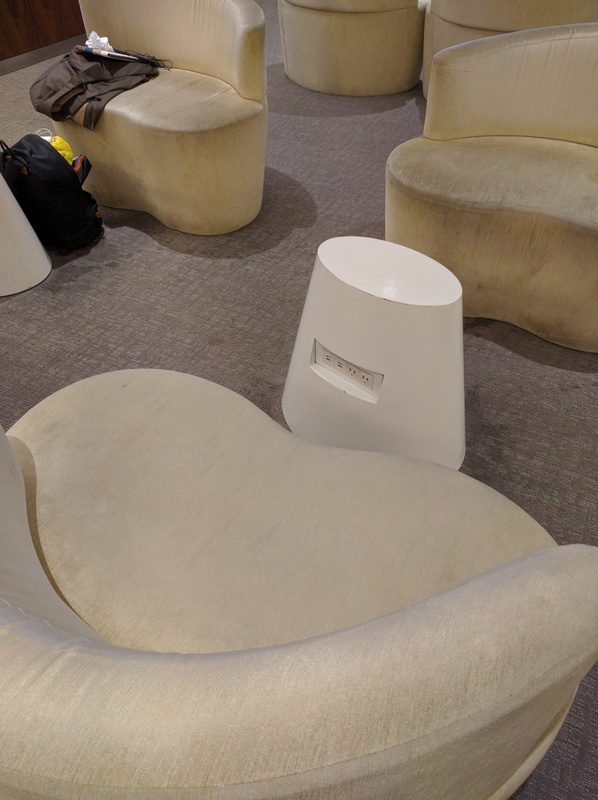 While unfortunate for a modern aircraft, the seat was fairly comfortable. 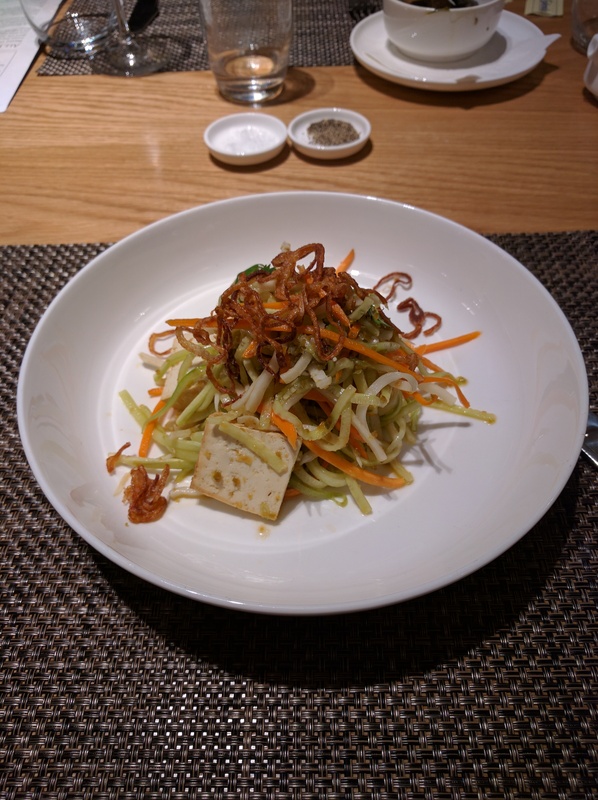 I had ordered the vegetarian meal in advance of the flight, so my starter began with asorted vegetables. The next vegetarian course was grilled vegetables, along with a tomato filled with pesto. 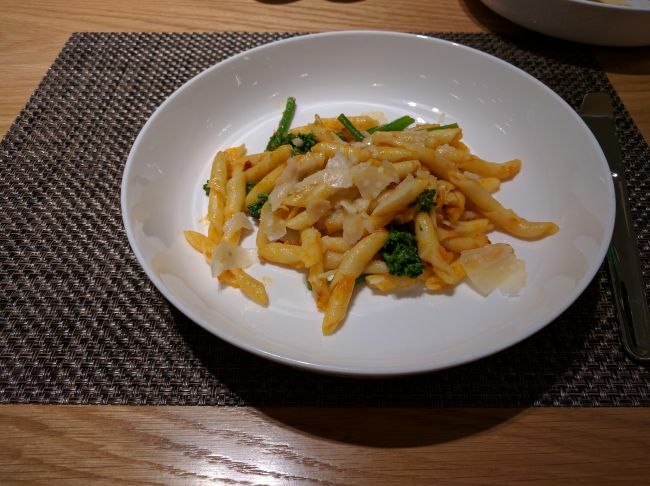 The main vegetarian course was pasta with tomato sauce and mushrooms. 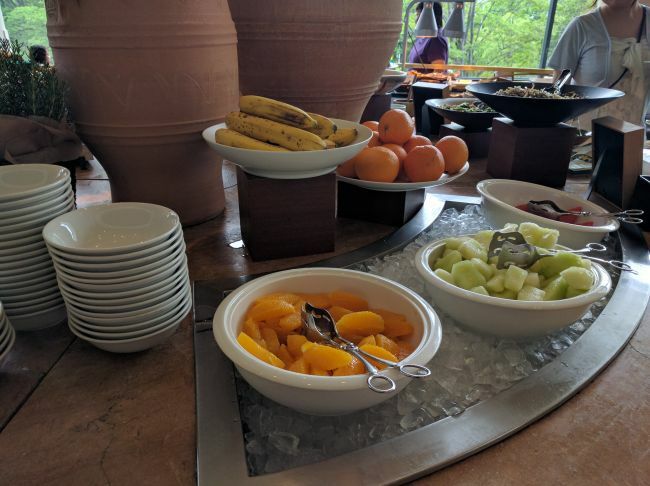 The vegetarian desert was a cup of fresh fruit, somehow different from the banana compote on the menu. 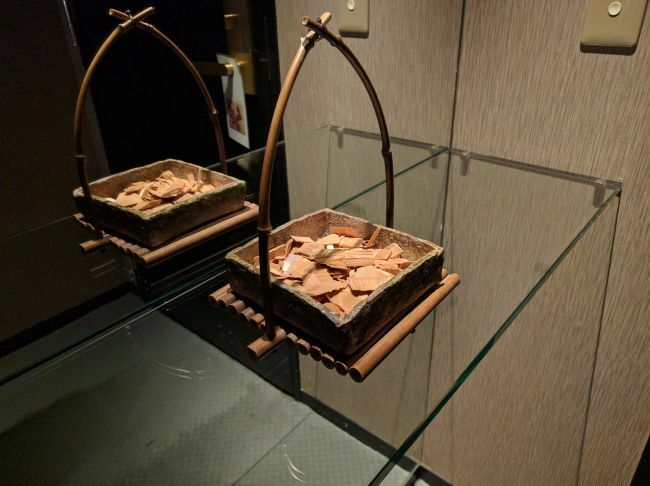 To start our meal before arrival, the crew had prepared a thank you note in chocolate for the gift we had given earlier. 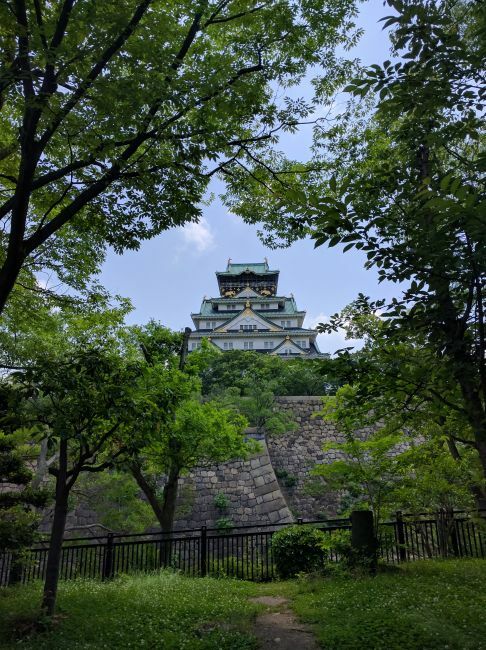 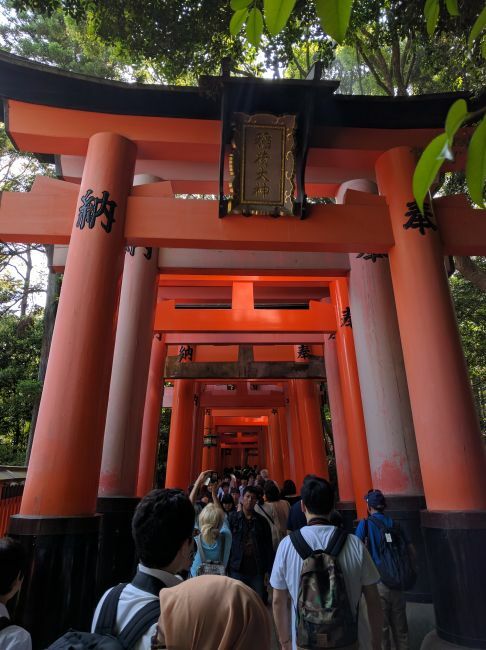 As a bit of a reboot until things can be backfilled, I’m jumping ahead in trip reports to mid-2016. 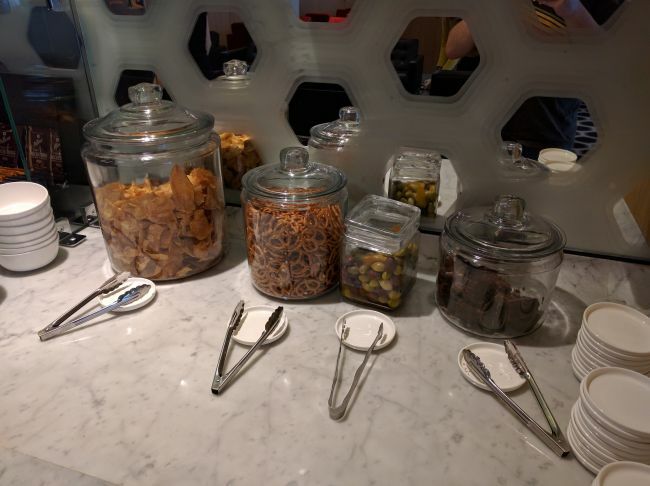 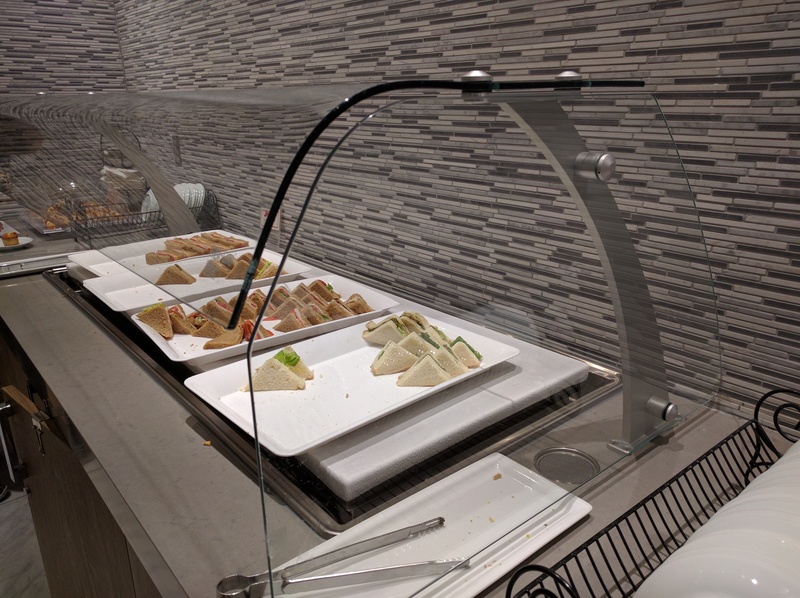 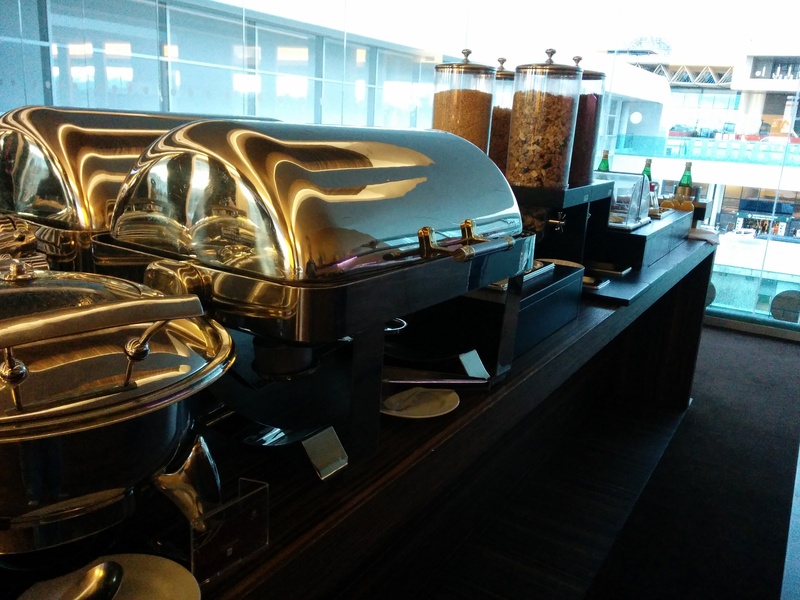 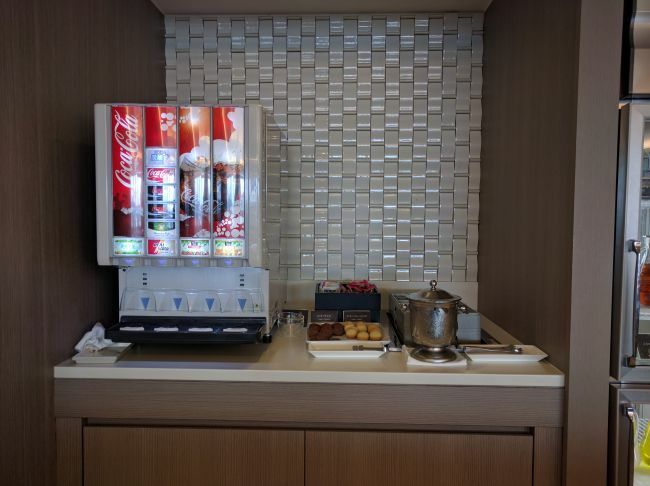 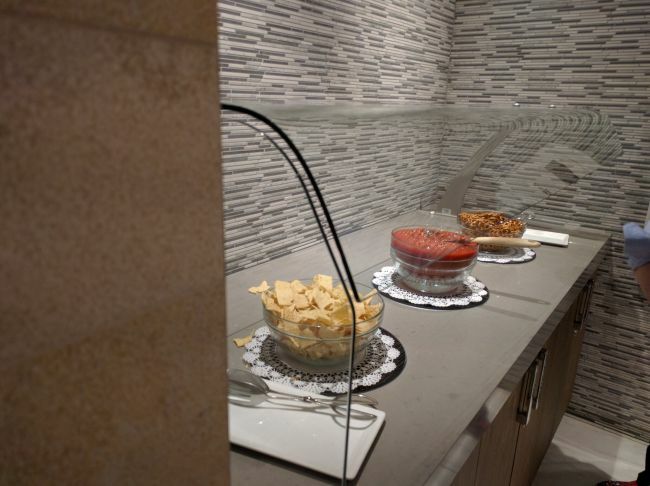 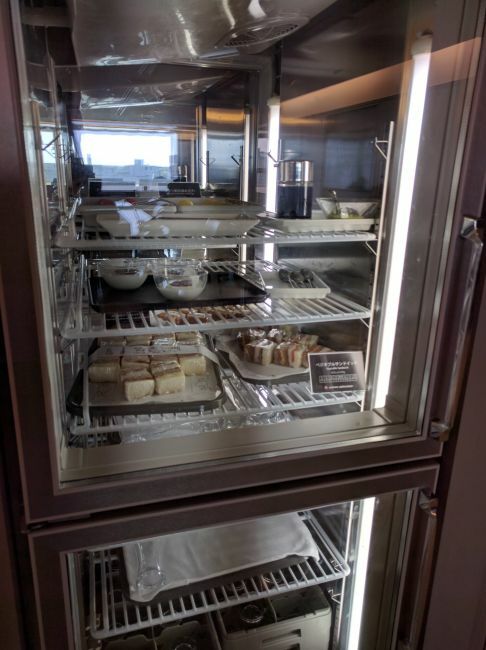 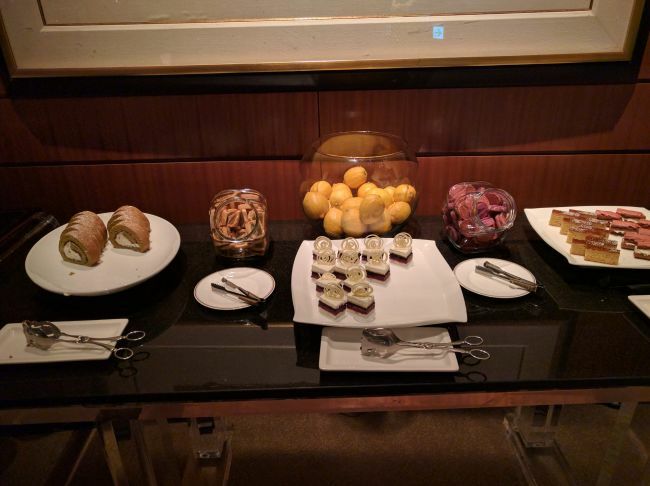 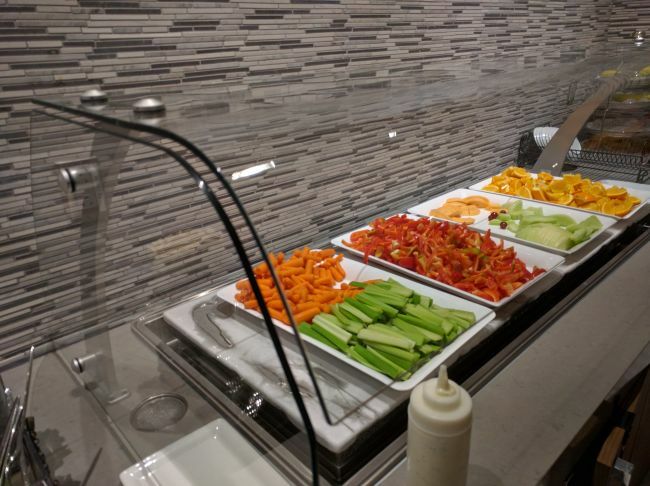 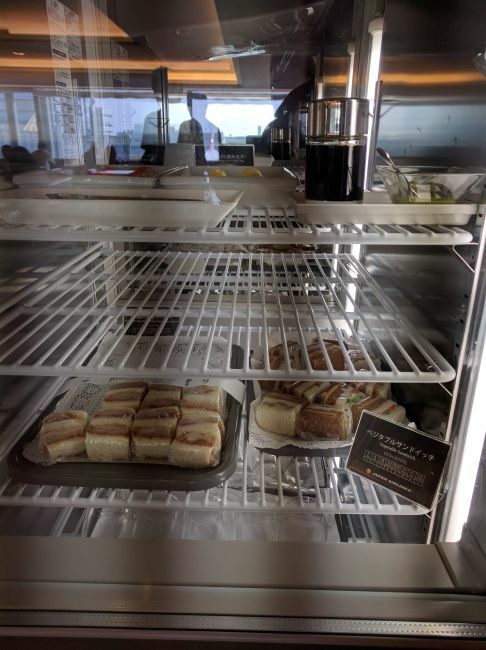 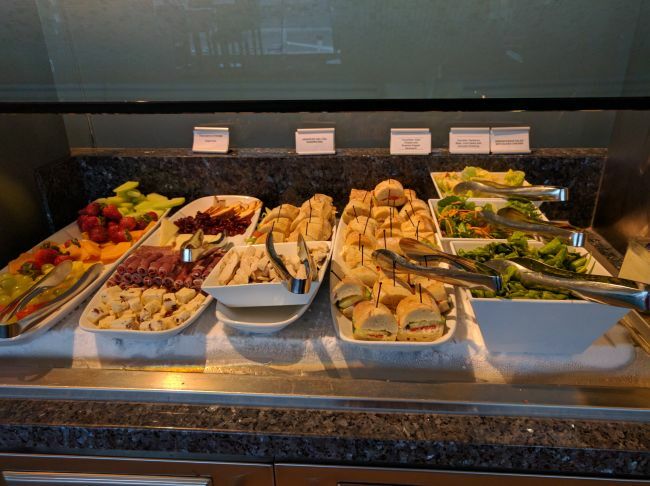 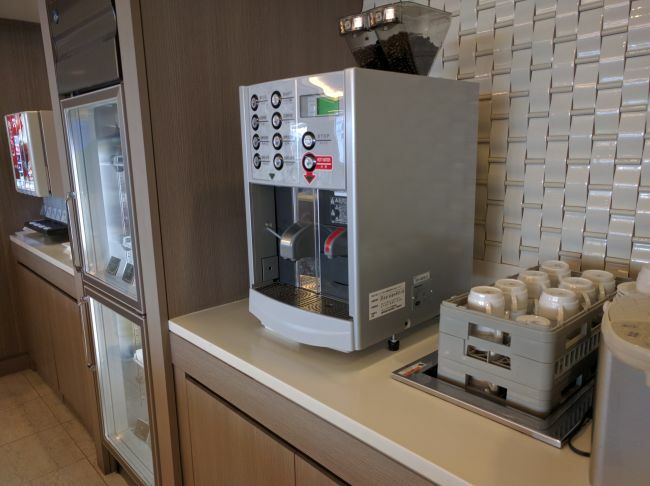 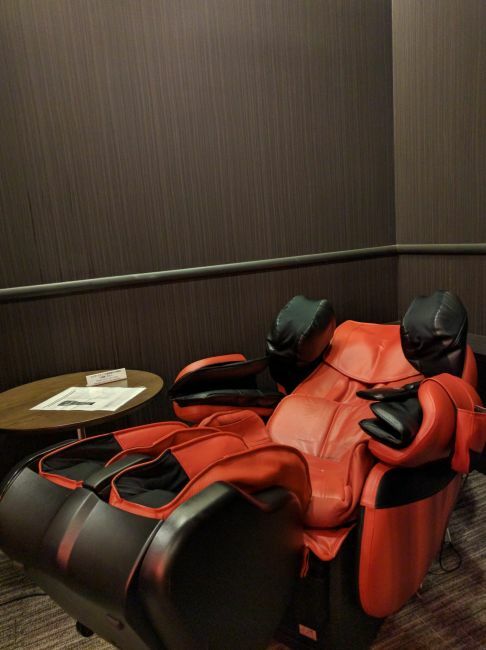 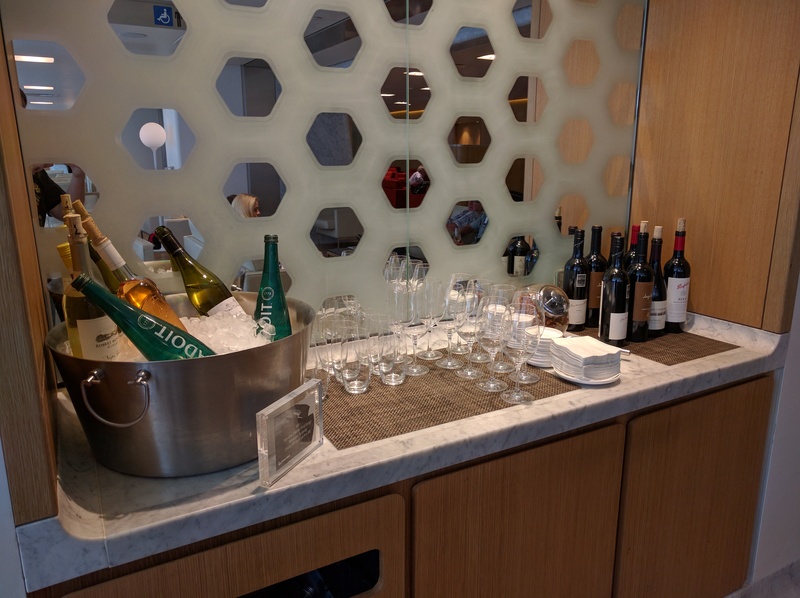 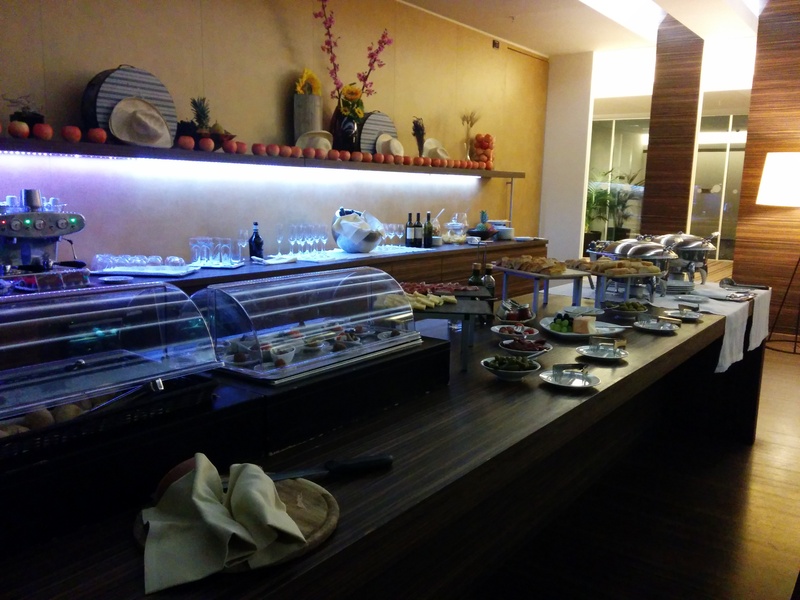 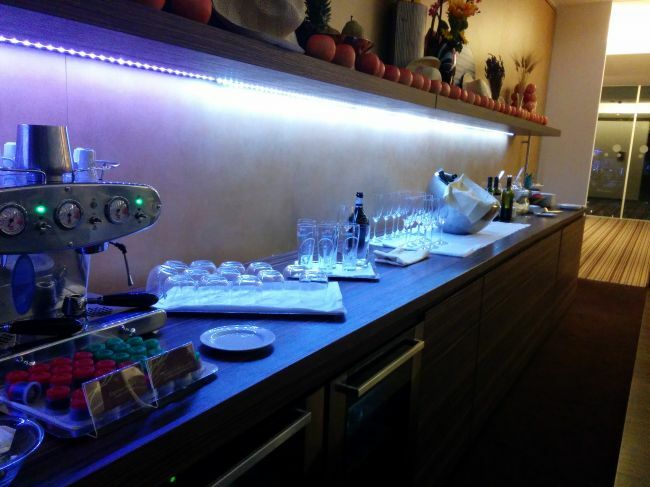 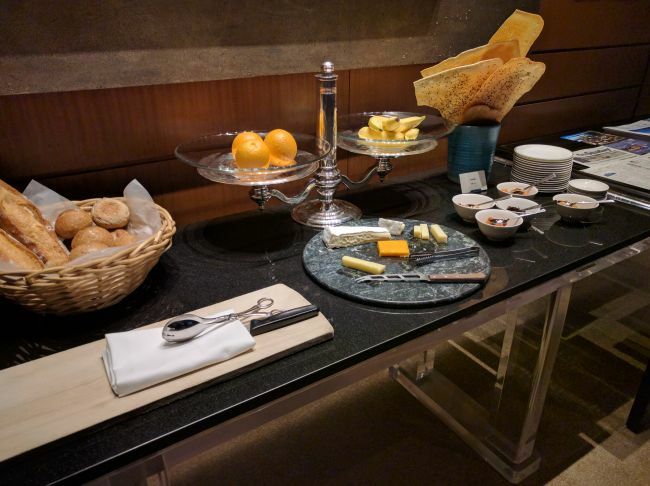 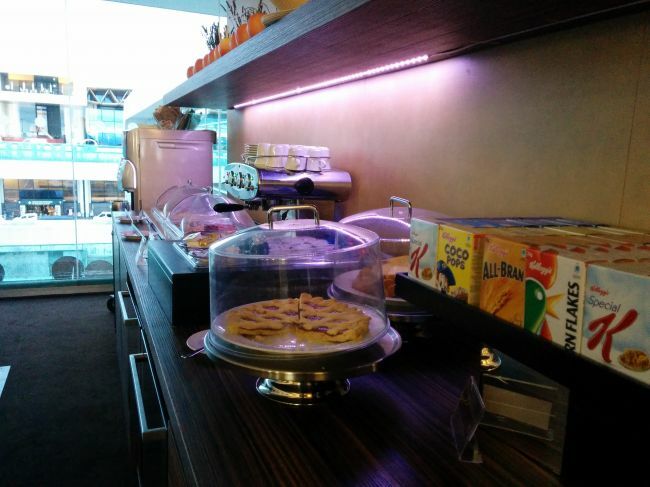 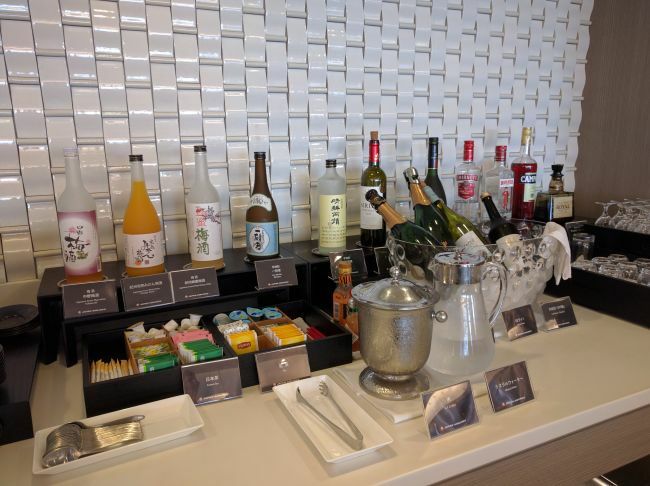 As a oneworld Emerald, we were able to stop by the first class lounge at LAX. 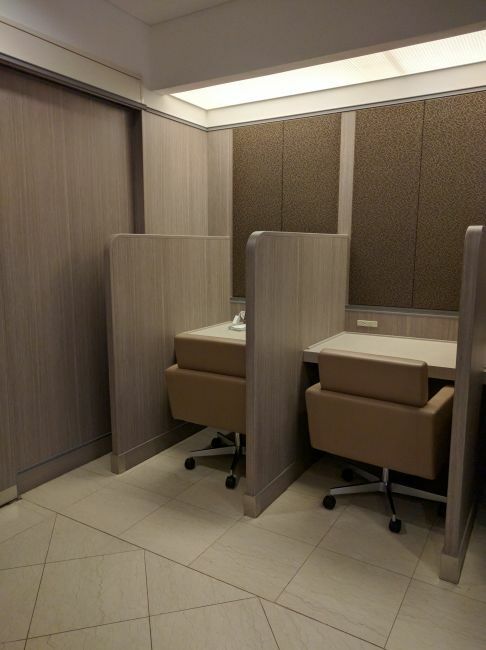 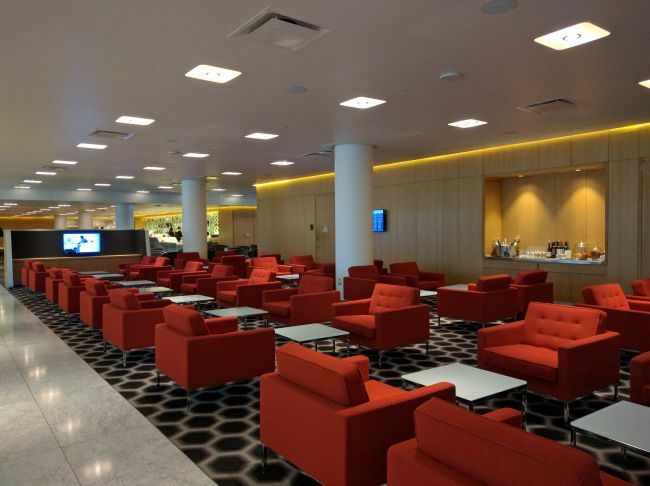 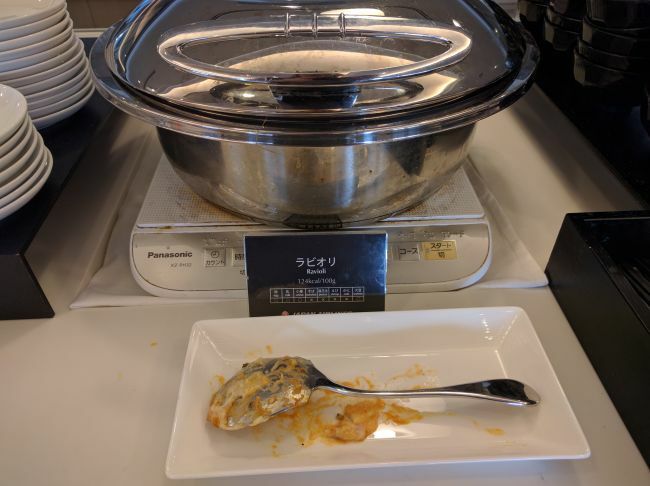 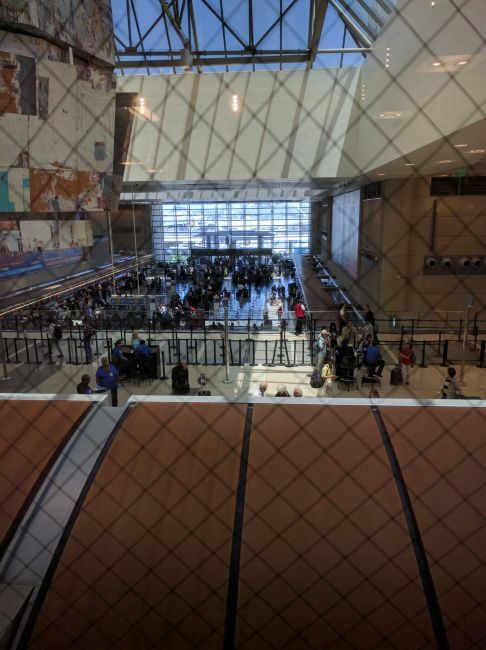 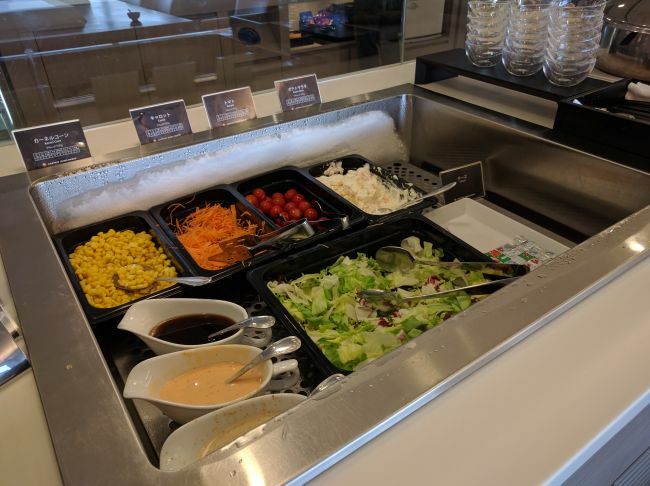 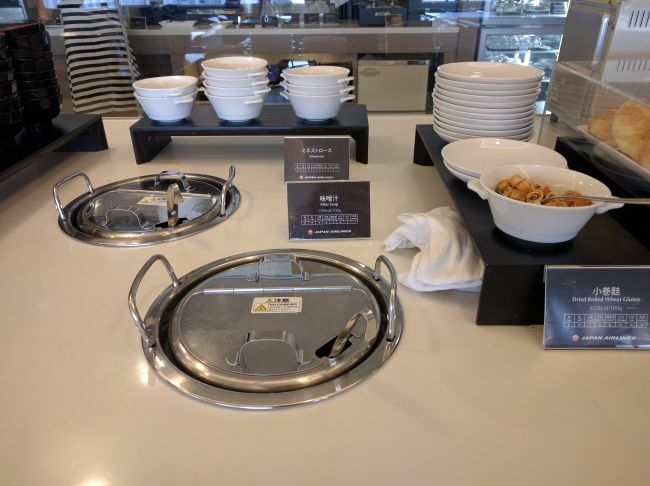 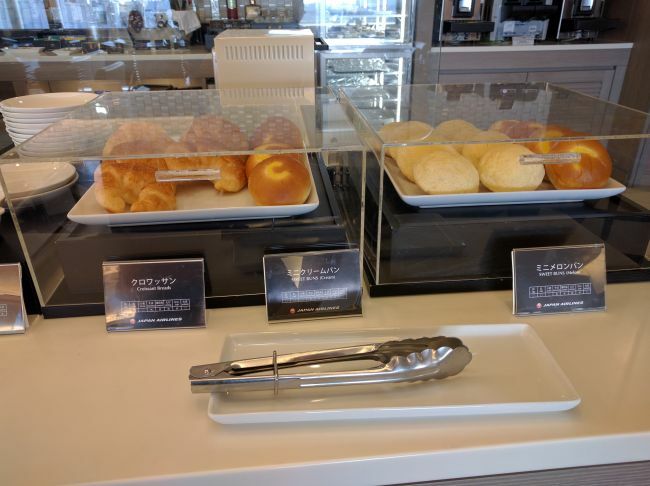 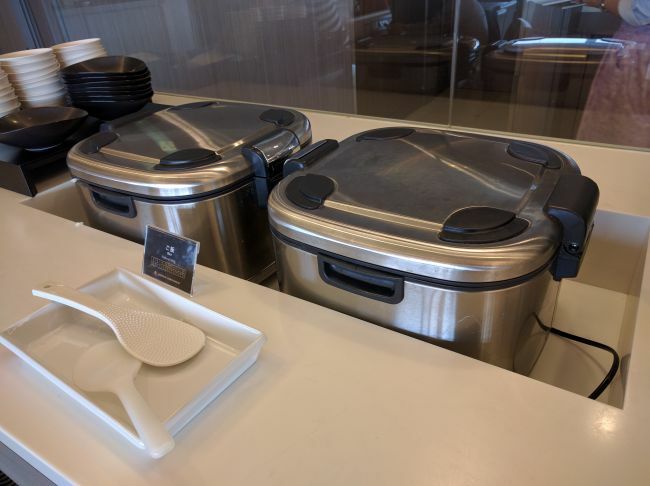 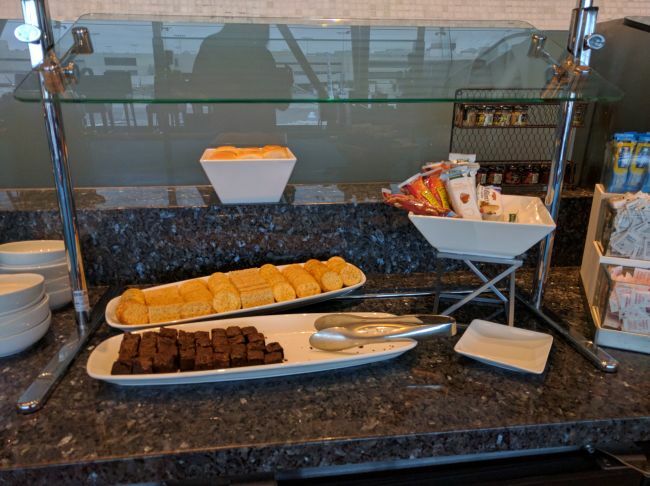 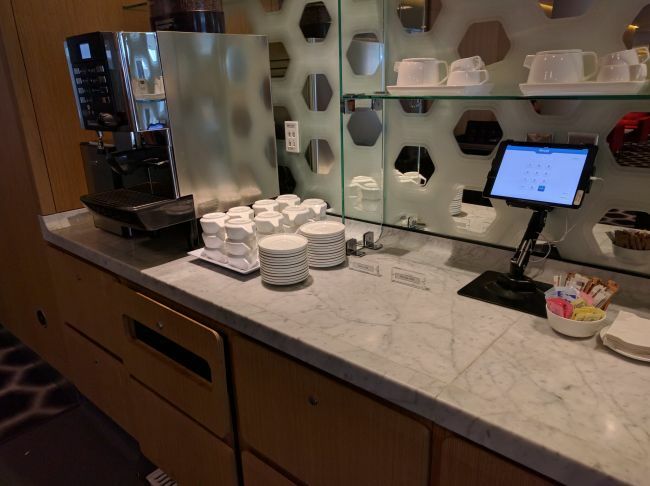 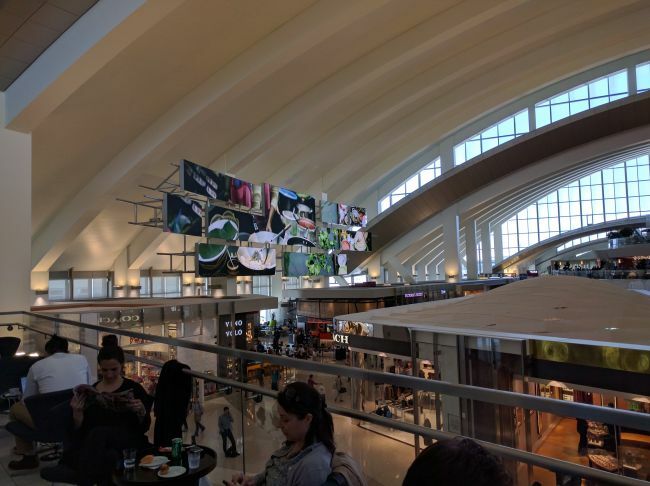 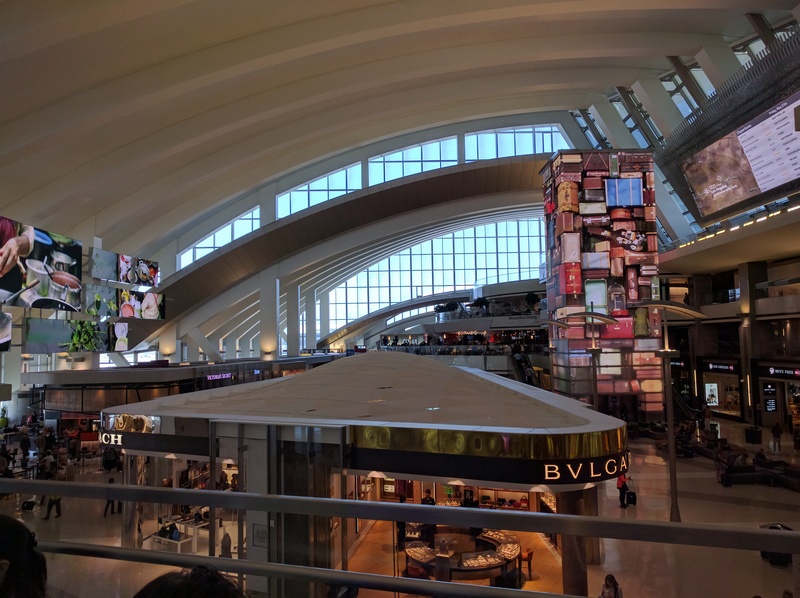 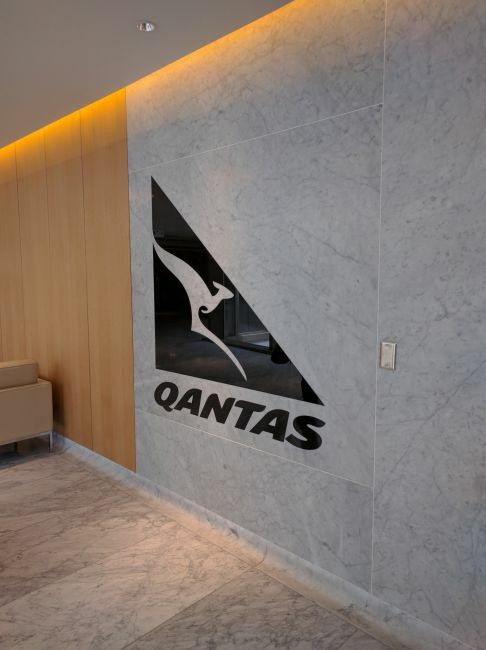 Due to apparent lounge rules, it’s not possible to hop between the business class and the first class oneworld lounges in the Tom Bradley terminal. 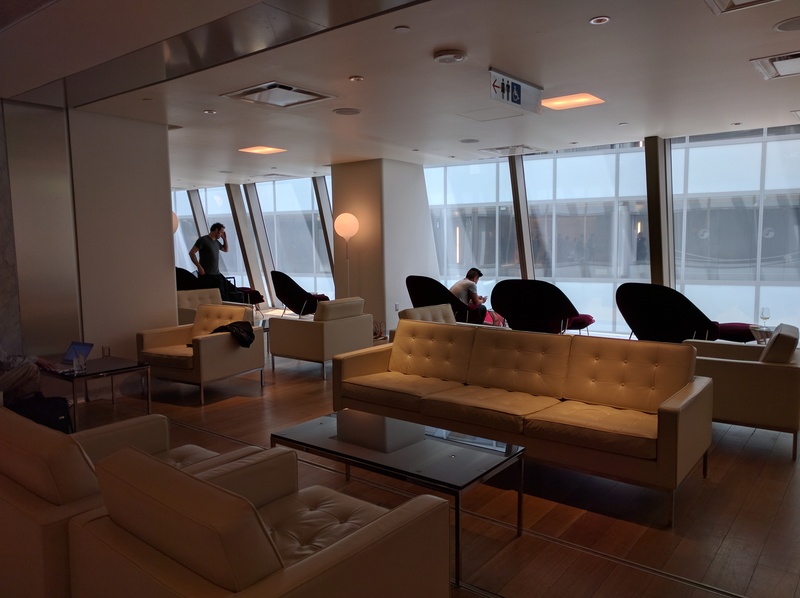 The lounge features a large seating area looking inwards towards an atrium, a bar, and a sit-down dining area. 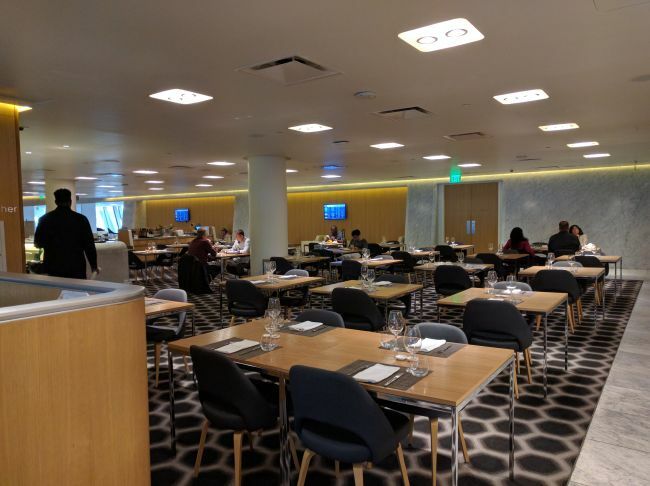 The far end of the restaurant overlooks the security checkpoint and ticketing hall. 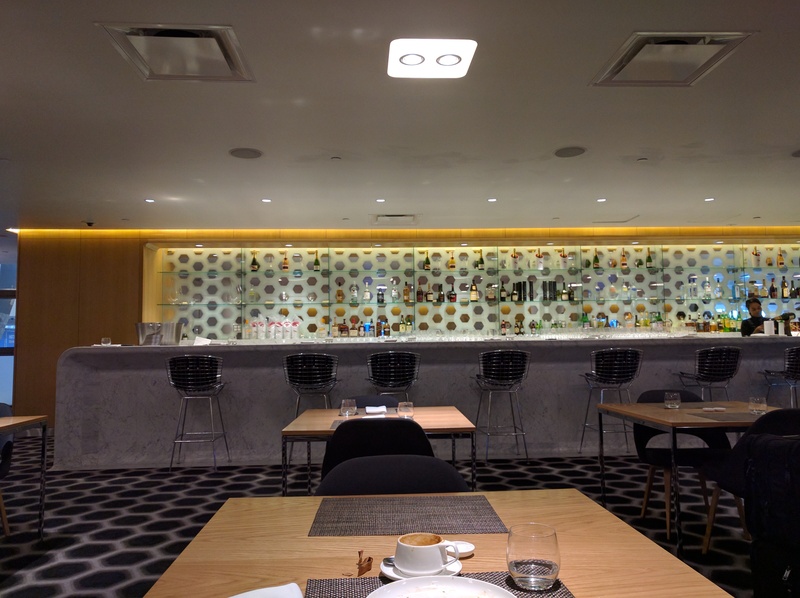 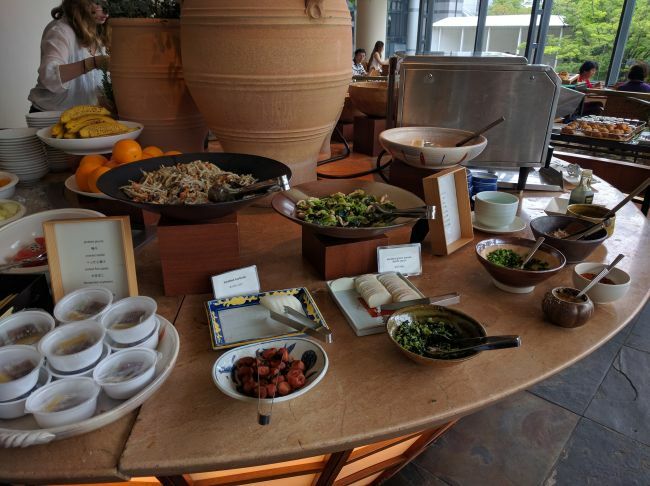 Lunch service wasn’t quite ready to begin, so we wandered around the lounge for a bit. 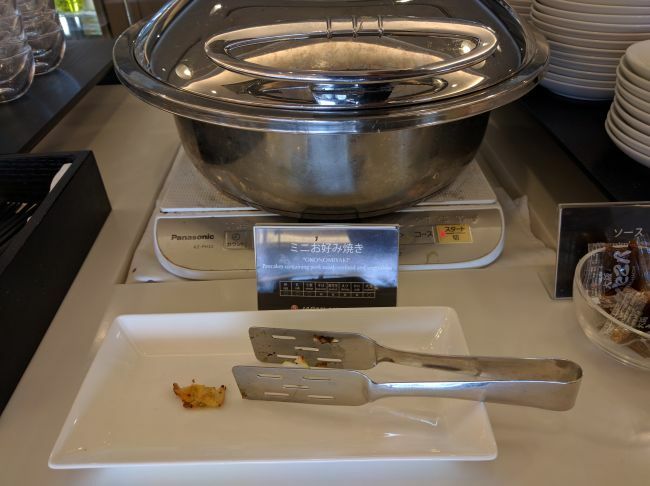 Between waiting for lunch to start and the length of service of a three course meal itself (from appetizer to dessert took about an hour), this was not a quick bite before catching a flight. I started with the spiced tofu salad, dropping the chicken. 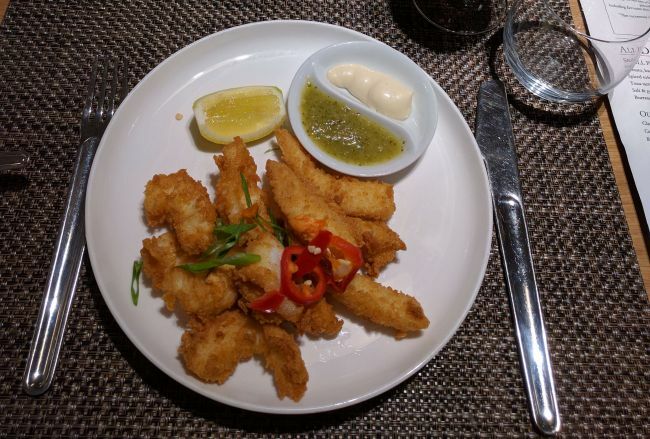 My girlfriend ordered the salt and pepper squid. 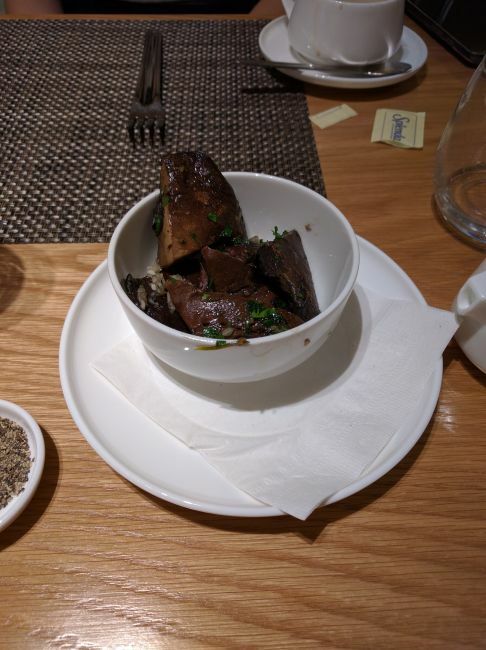 Additionally, we ordered a set of sautéed mushrooms in garlic butter for the table. I ordered the casarecce with broccolini, chili, and parmesan as my main course. 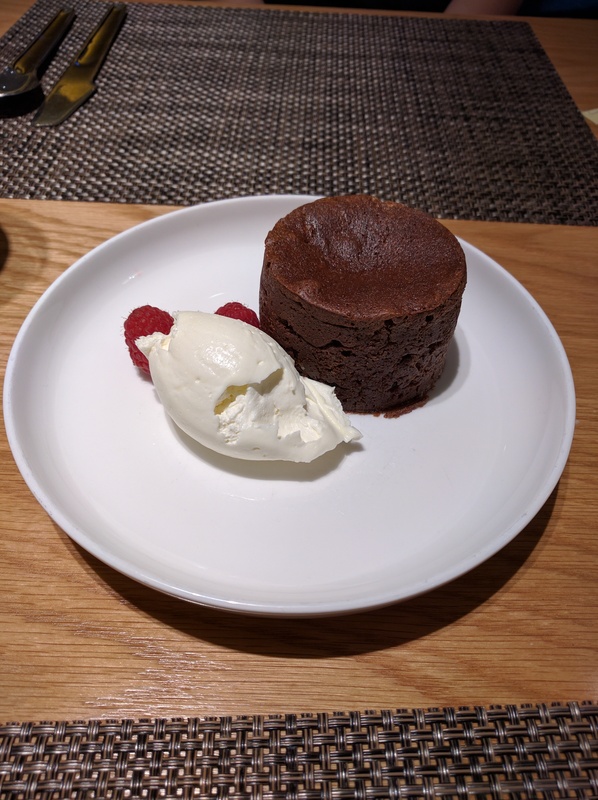 For desert, we picked the chocolate fondant with raspberries and marscapone. 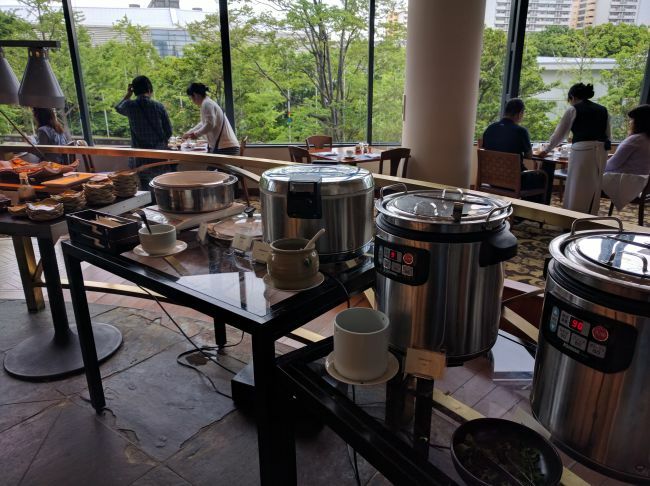 Outside of the restaurant, though, the immediate, self-serve food offerings were a bit sparse. 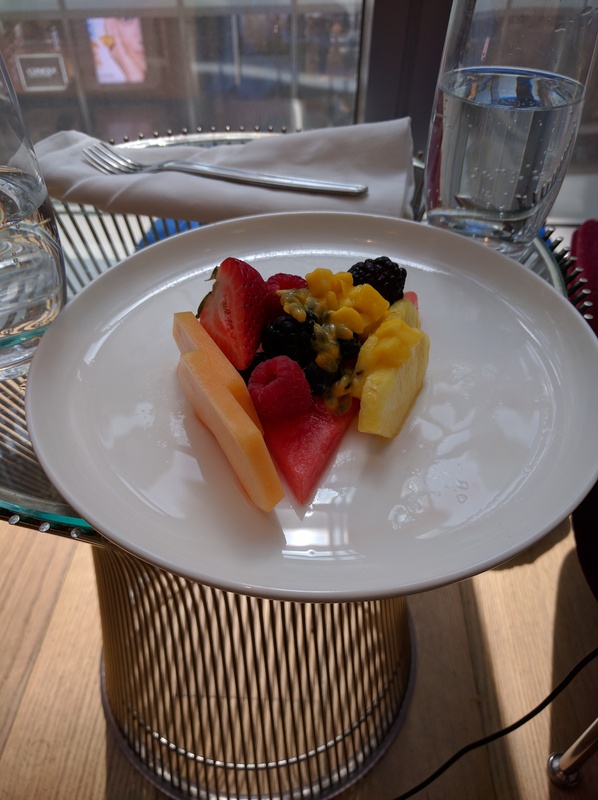 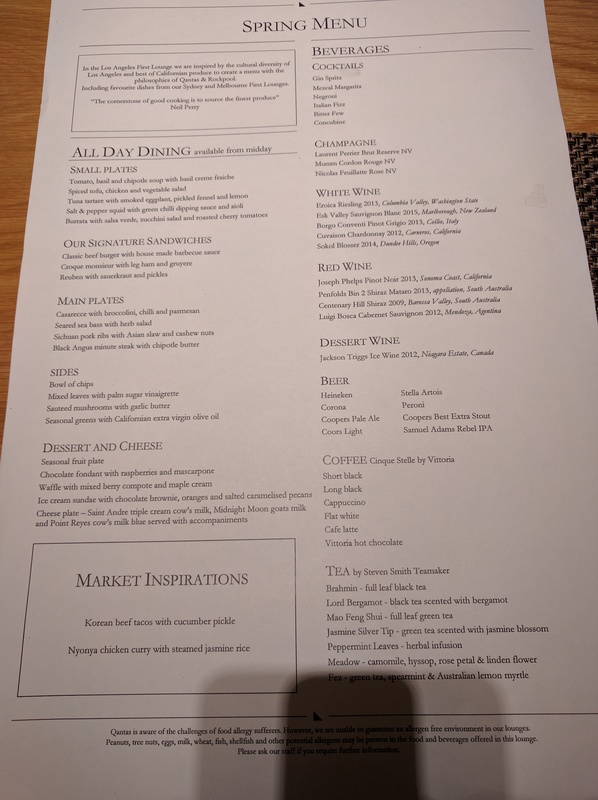 It is possible to order from the restaurant menu while sitting elsewhere in the lounge: We asked for a fruit plate from the staff and had one delivered to our chairs. 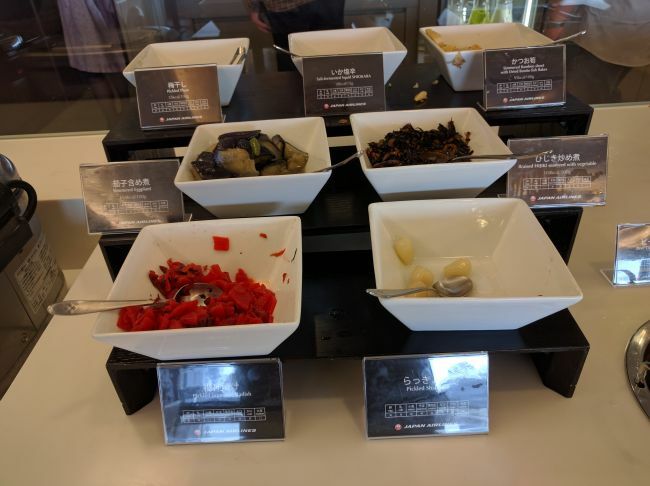 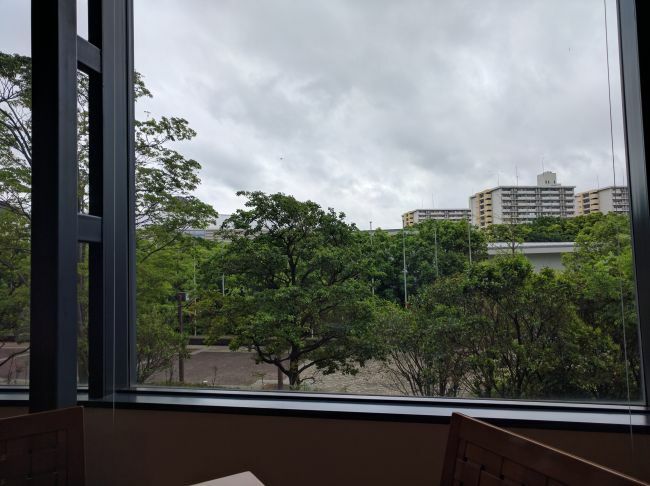 Nevertheless, I’m not quite sure where this would leave you if the restaurant was changing over from breakfast to lunch as it was when we first arrived. 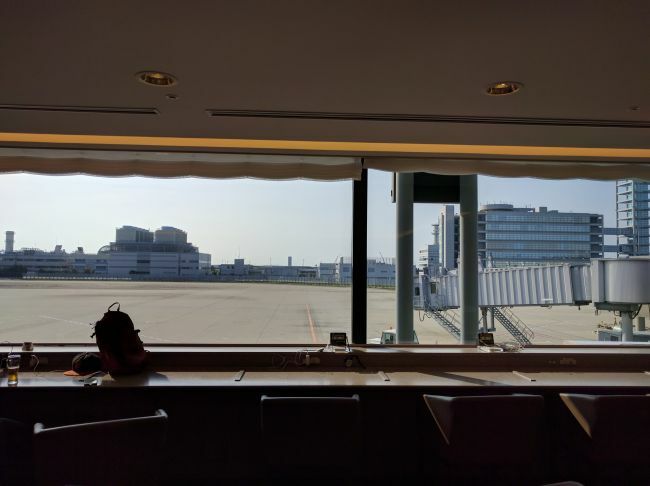 With a bit of time to kill, we hopped over to the KAL lounge across the hallway using Priority Pass. 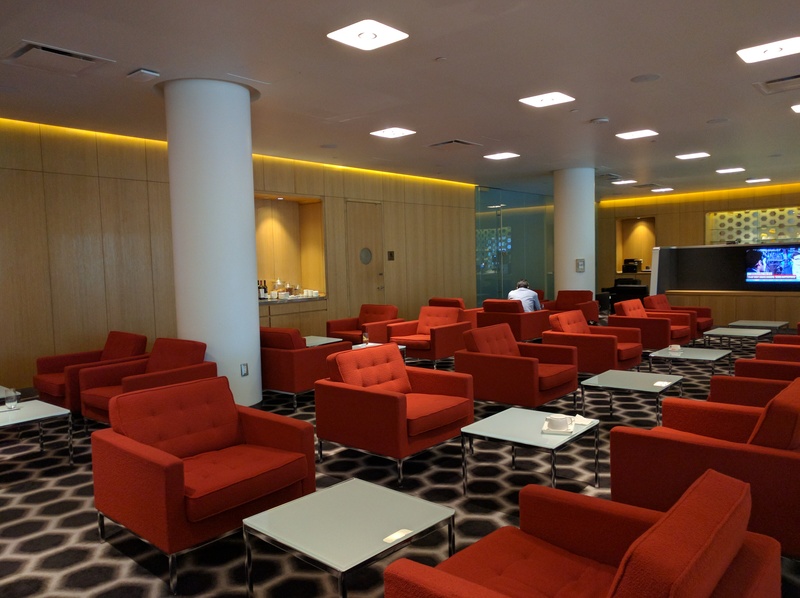 The lounge was a bit more crowded than the Qantas lounge, and the self-serve food less interesting. 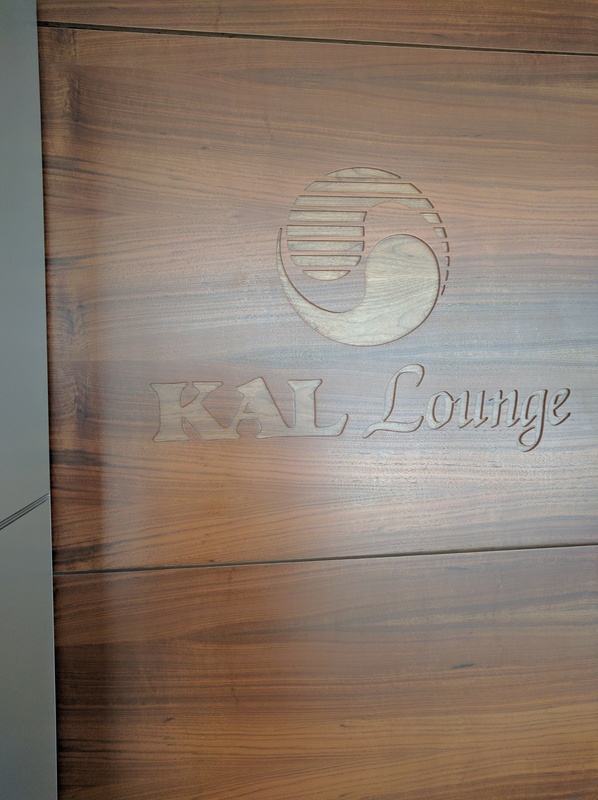 The KAL lounge, however, did manage to have plentiful outlets everywhere, thereby resolving one of my biggest pet peeves when traveling. 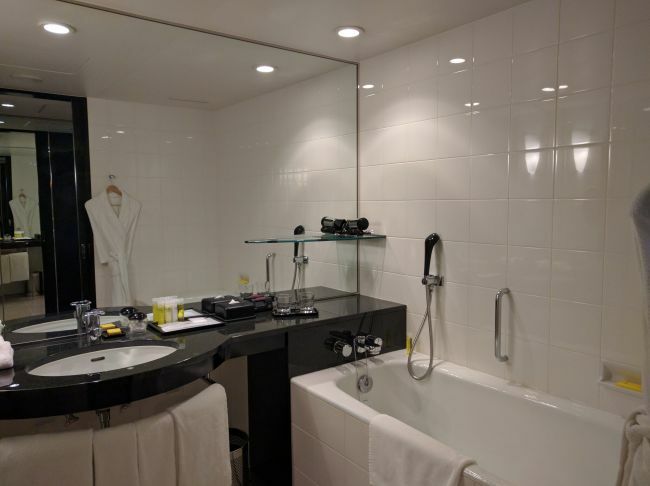 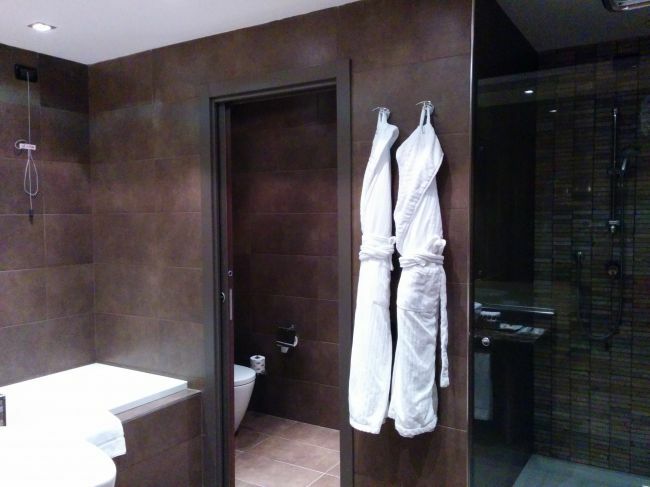 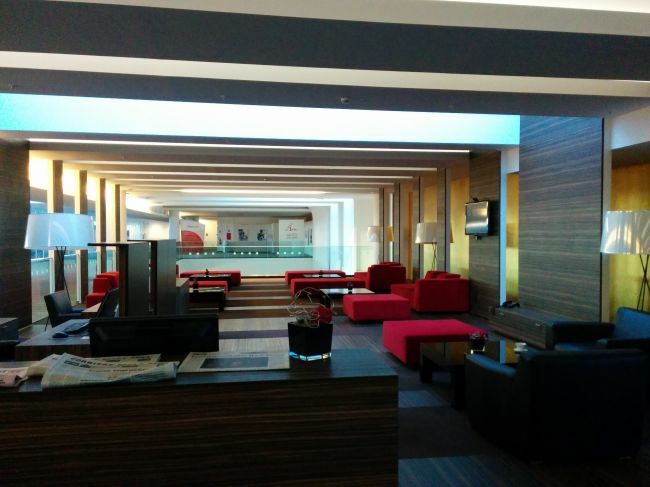 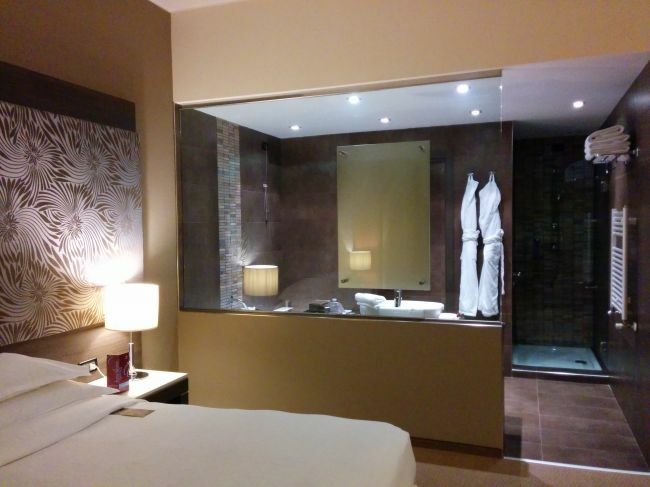 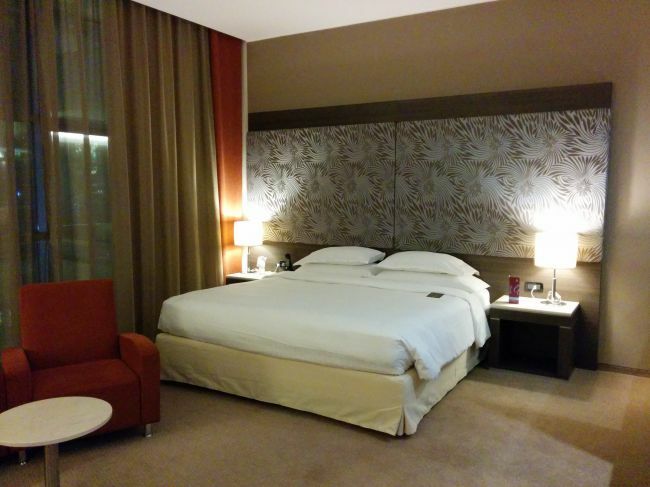 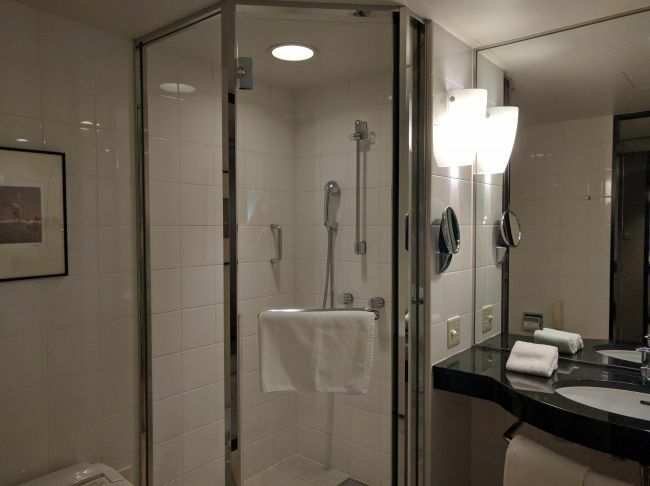 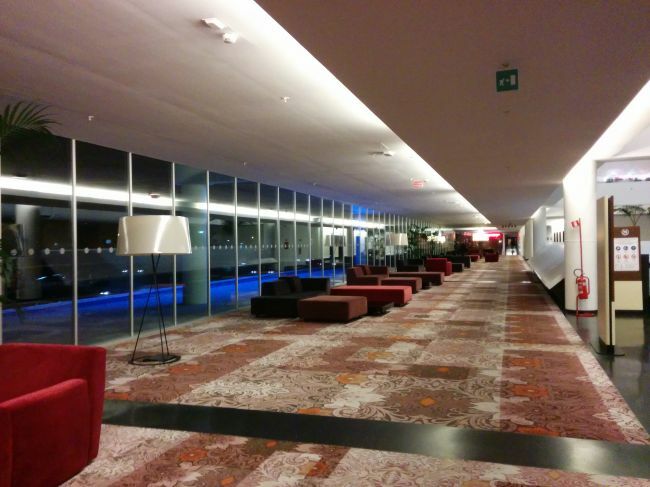 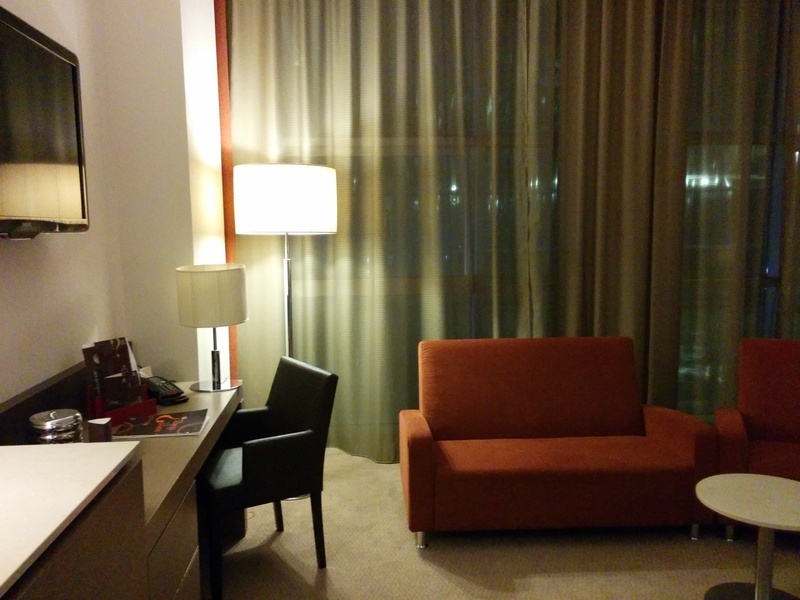 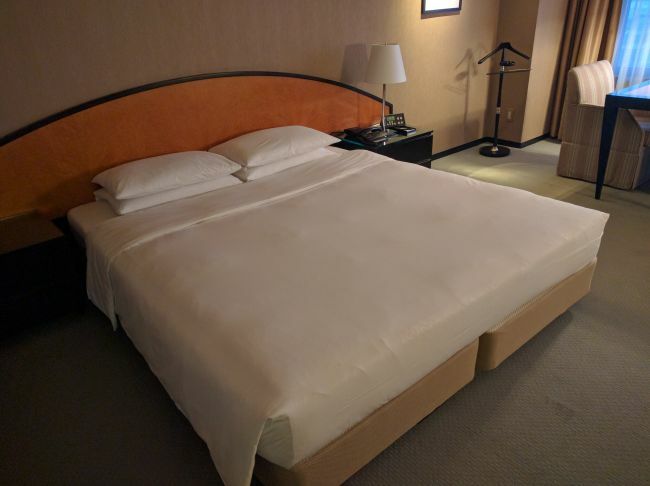 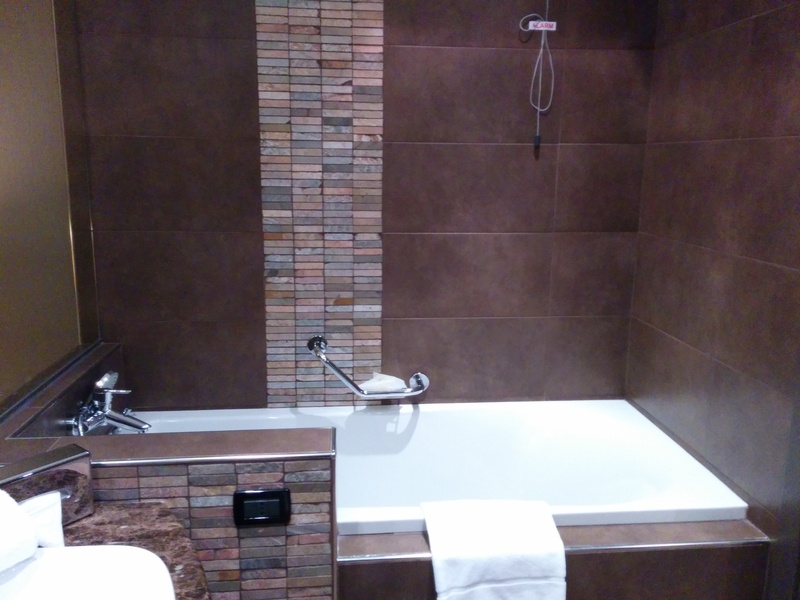 For my last night in Milan, I booked another night at the Sheraton Milan Malpensa Airport hotel. 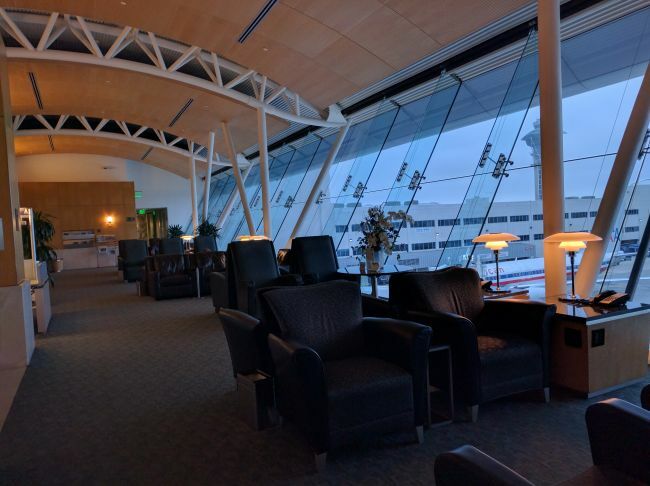 While my experience a few months prior was lackluster, the airport is really convenient for early morning flights. 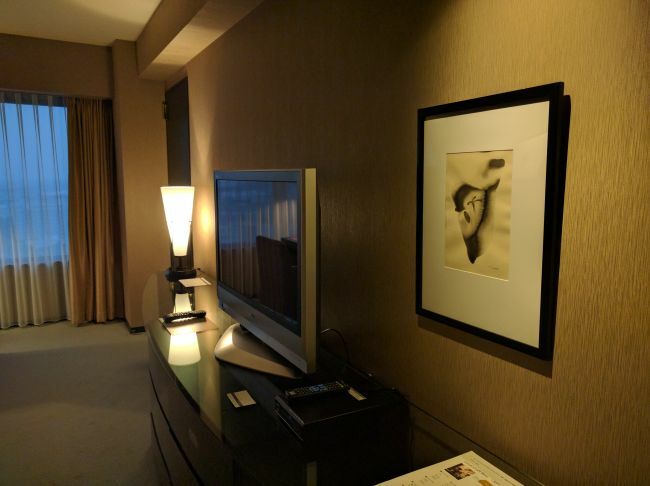 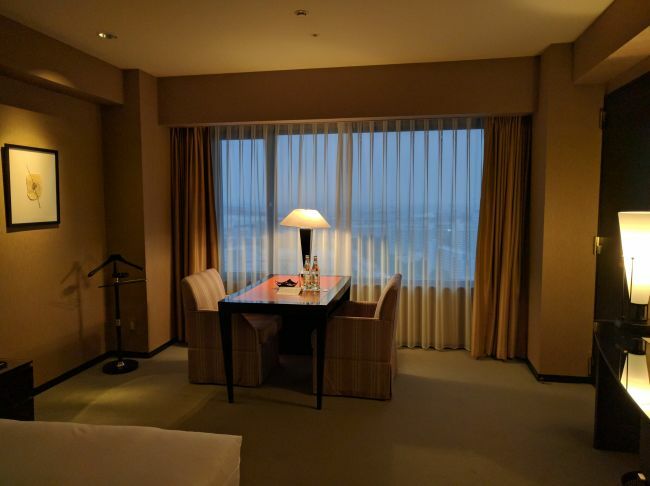 This time around, I was upgraded to a deluxe room. 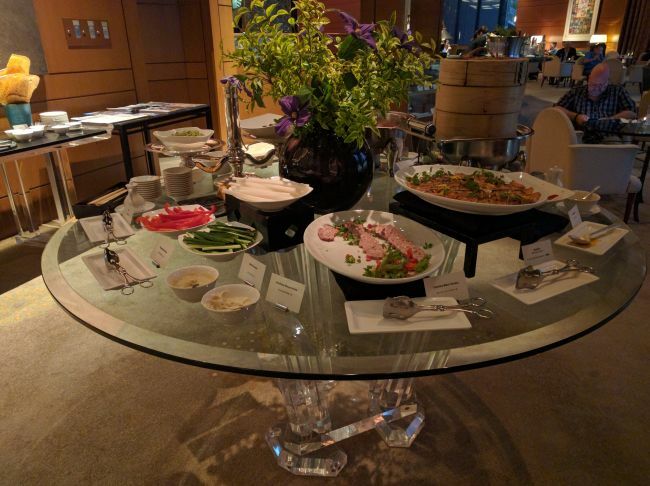 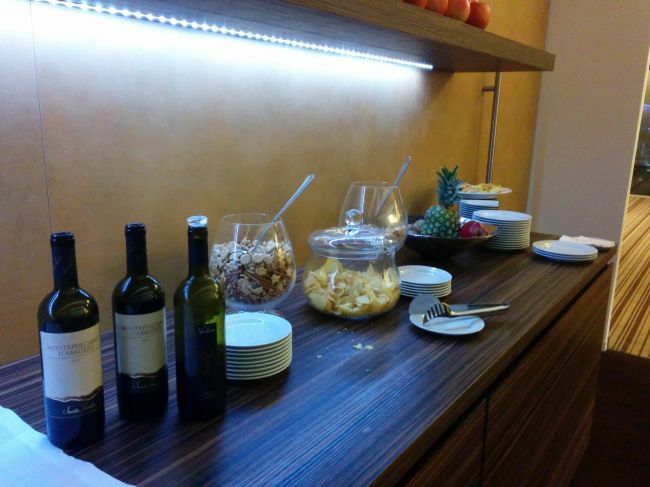 After checking in, I took a look at the club on the third floor, where a spread of snacks and beverages was available. 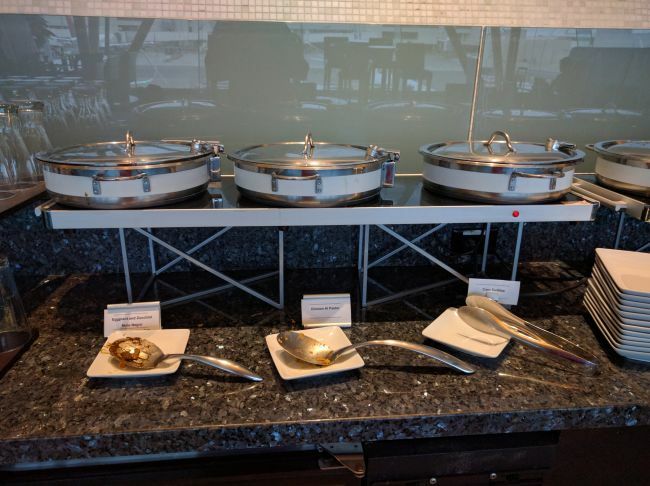 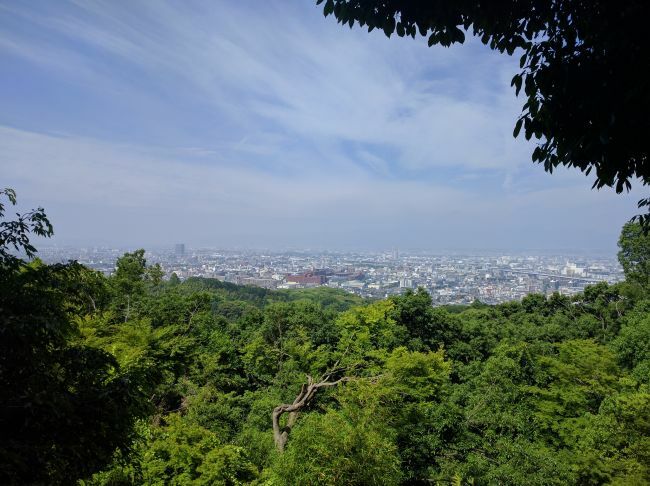 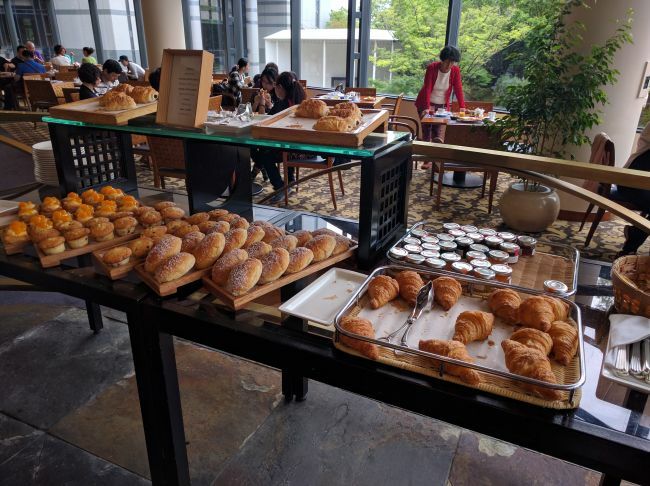 The next morning, I returned to the club for breakfast. 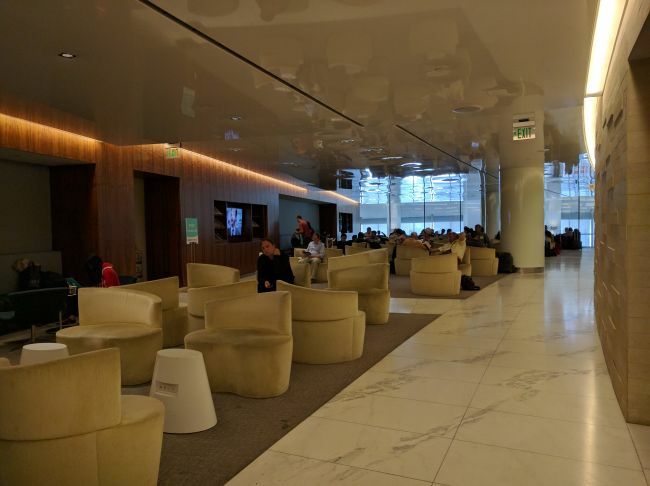 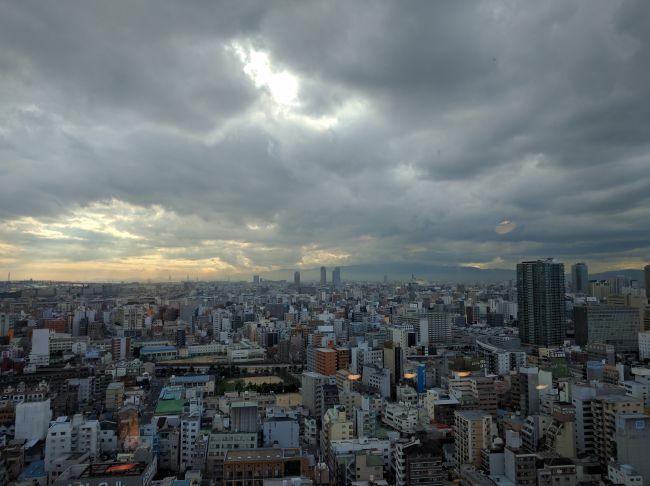 One of the TVs was playing news coverage that Ethiopian Airlines Flight 702 bound for Milan had been hijacked. 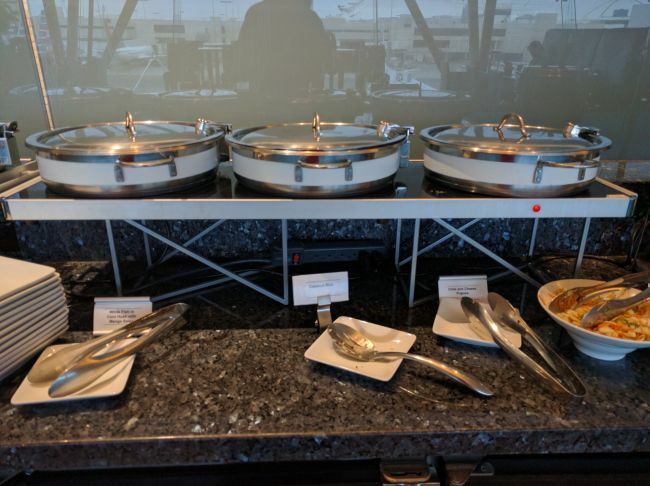 I finished my breakfast and walked over to the airport terminal, ultimately thankful that the media coverage of the hijacked flight didn’t translate into pandemonium at the airport.